The Afterlife played an important role in Greek mythology, with its own powerful god, in the form of Hades, the Underworld and life after death were significant to the Ancient Greeks. It was therefore thought important to lead one’s life in the “correct” way, and the way one had led one’s life would be reckoned by Three Judges of the Underworld. ​Plato would suggest that during the Golden Age of Greek mythology, when the Titans under Cronus ruled the cosmos, that there were judges of the dead, but when the Olympians under Zeus came to power it was necessary to replace these unnamed judges of the Underworld. It was said that Hades came to Zeus, after some time of rule, and said that the judges were now no longer able to recognise good from bad, and were fooled by the outward appearance of each individual. Zeus would thus choose three of his own sons to sit in judgement of the dead, these three judges of the dead being Aeacus, Minos and Rhadamanthys. Deceased souls, after they had been transported by a Psychopomp to the Underworld, and paid Charon to cross the Acheron, would walk a road until they came to the seated Aeacus, Minos and Rhadamanthys. Some sources tell of the three judges of the dead sitting in front of Hades’ palace, whilst others tell of the judgement of the dead taking place upon the Plain of Judgement. The three judges would not decide the eternal future of each soul though, for it was said that Aeacus judged those who came from Europe, whilst Rhadamanthys judged those from Asia, and Minos would only decide if Aeacus or Rhadamanthys were undecided. The decision of the judges of the underworld would see the deceased spend eternity in Elysium if they were worth, Tartarus if they had been wicked, or in the Asphodel Meadows, if their previous life had been neither good nor bad. The aim was of course to go to Elysium, paradise for the Ancient Greeks, for those who resided in the Asphodel Meadows, had a meaningless and monotonous existence, whilst punishment awaited those destined for Tartarus. Now it should be said that not all of the deceased would be judged, for the truly heroic or the truly wicked could be sent to Elysium (or the Isles of the Blest) or Tartarus through the will of a powerful god; that god normally being Zeus when it comes to those punished in Tartarus. 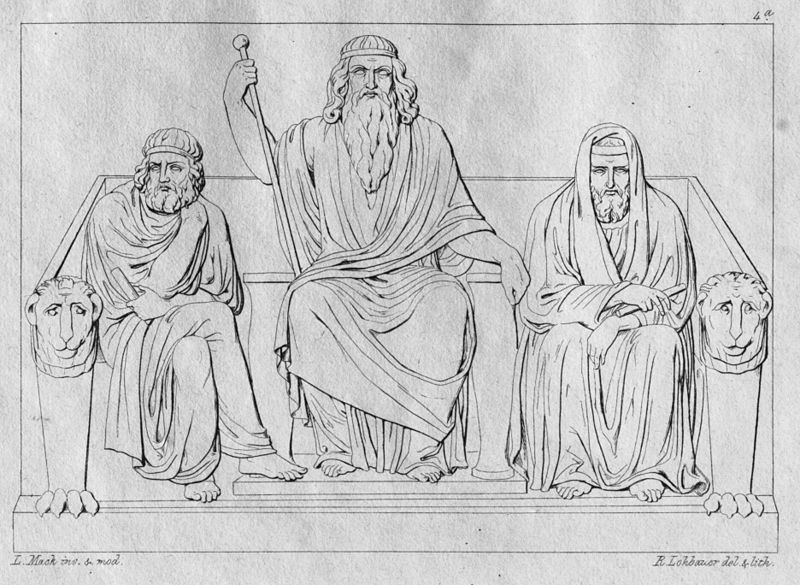 Aeacus, Minos and Rhadamanthys were not simply chosen because they were sons of Zeus, for there were many other sons born to Zeus as well; each of the judges of the dead had been mortal kings, but again many sons of Zeus were kings; but most importantly, Aeacus, Minos and Rhadamanthys were named as having established law and order, and being of sound judgement. Aeacus was a son of Zeus born to the Oceanid Aegina after Zeus had abducted the beautiful nymph and subsequently abandoned her on the island that would later bear her name. Aeacus would become king of the island of Aegina, and Zeus would give him a population to rule over by turning the ants on the island into people, the Myrmidons. Aeacus would have two famous sons, Telamon and Peleus, but as a king he was famous for his piety and his even-handedness when it came to passing judgements. The impartiality of Aeacus was also sufficient to see others visit his kingdom just so their problems could be resolved by the king. Aeacus would later judge the deceased of Europe, but he was also known as the Doorkeeper of Hades, for he was said to be in control of the keys to the Underworld. Minos might appear to be a strange choice for a judge of the dead, for the king of Crete made one of Greek mythology’s great bad decisions when he failed to sacrifice the Cretan Bull as he was supposed. This decision would see Crete ravaged by the bull, and would also see Minos’ wife, Pasiphae, become pregnant with the Minotaur by the Cretan Bull. Less famous though, it was said to be Minos who brought codified law to Crete, enshrining fair laws; the good and bad judgement of King Minos, as led to writers putting forth the notion of two kings of Crete called Minos. The first being the son of Zeus who brought law to the island, and the second be a grandson of the first. Anyway, King Minos of Crete would be the arbitrator if there was indecision amongst the judges of the dead. Rhadamanthys was a son of Europa and Zeus, just like Minos, but was exiled by his brother for possibly being a competitor to the throne of Crete. Rhadamanthys would travel to Boeotia and there, at Ocaleia, would establish a new kingdom which he would rule until his death. King Rhadamanthys would be known for his fairness and honesty, undertaking everything that he did with the greatest of integrity. In the Underworld, Rhadamanthys would be known as the Lord of Elysium, giving the indication that he ruled over paradise and the heroes who resided there; Rhadamanthys was also the judge of the deceased from Asia. Some sources would also name Triptolemus as a judge of the dead, given specific rule over the deceased who had undertaken the Mysteries. Triptolemus was a prince of Eleusis, and one who welcomed Demeter to the city as she searched for her missing daughter, Persephone. Demeter would teach Triptolemus in agricultural skills, as well as the secrets of the Mysteries.